As the saying goes, timing is everything, and that certainly is the case for one of the leading scorers on Quinnipiac women’s lacrosse and her coach. Just a few years ago, junior attack Megan Szawlowski was recruited to Central Connecticut State University by head coach Tanya Kotowicz. Kotowicz left CCSU for the Quinnipiac head coaching job, and just three years later, Szawlowski transferred to Quinnipiac, finding themselves together in Hamden. 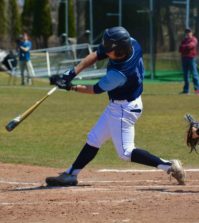 Kotowicz couldn’t be happier to have Szawlowski as a Bobcat. Things are finally starting to come together for the junior attack and her coach, and even though events haven’t transpired exactly how it was originally planned, that is definitely not a bad thing according to the duo. Things have definitely worked out recently, as Szawlowski is now one of Quinnipiac’s best goal scorers as a transfer in her first year in the MAAC. Even though initial plans didn’t surface, the dust has finally settled for both of their careers in Hamden. Szawlowski has burst onto the scene this season, with 28 goals and 16 assists in just 13 games played. Szawlowski is contributing much more than just goals and assists, as her leadership qualities have shined recently as well. Szawlowski has been able to adjust extremely quickly, considering it is uncommon for a transfer to accept such a large role right out of the gate. Szawlowski gives a copious amount of credit to her teammates, since they were the ones that got her to find her comfort zone on and off the field. Oftentimes, it is not totally common for a transfer to come to a team and be its leader. Yet, not only does she have 44 points in just 13 games, but she is also a vocal leader and helps her teammates despite this being her first year as a Bobcat. Szawlowski was originally recruited to Quinnipiac, however during the recruiting process it was not the right fit out of high school. Since Central was milder competition and an easier adjustment academically, that is where she felt was best for her to get her feet wet. 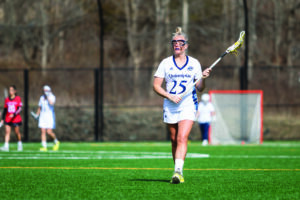 Once she was immersed into college lacrosse, she realized her skill and saw that she could do more. Once Szawlowski noticed her potential, Kotowicz was instrumental in getting her to finally be a Bobcat. 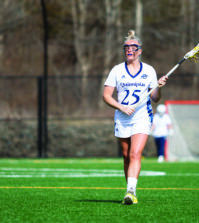 Not only has Kotowicz finally gotten the most out of her star transfer, but Quinnipiac women’s lacrosse has made steps in the right direction as well. Kotowicz had a couple years to progress the program, and that was another attractive aspect of the then transferring Szawlowski. Even though things did not click overnight, it was always meant to be. That is the feeling that is coming from this season for Szawlowski, since she is a leader on a team that is taking on new challenges all the time. With five hat-trick performances already this season, Szawlowski has been able to balance her scoring with her leadership and has molded into an extremely balanced and focused player. Even though this was not the original plan, it is safe to say both player and coach are happy with the new situation. Kotowicz has had high praise for Szawlowski since they teamed up, and she even admits to backing out to go to Quinnipiac and not realizing her full potential the first time. However, she didn’t make the same mistake twice. With her growth and maturity, all the Bobcats can hope for is for Szawlowski to keep doing what she’s doing for them. Things were not always like this for the Bobcats, since they actually know what it is like to get scored on a few times by Szawlowski. That’s why when she scores for them, they never take it for granted. With that sense of humor, it is clear that this was how things were meant to work out. Players joke all the time about the past with Szawlowski, since everything happens for a reason and things sometimes just work out how they’re meant to. With Szawlowski almost exceeding her 30-goal mark already, it is safe to say that things are working out much better than anyone anticipated for the surprise transfer who’s scored and lead more than anyone could have ever imagined.